After garlic, I think Broad Beans are my favourite vegetable. Whilst it's only a short season of cropping broad beans, those (approx) six weeks are just heavenly to me. There is something about freshly picked and cooked broad beans that sends my taste buds wild. Shop bought, whether 'fresh' or frozen, simply do not compare. However, from a Spoonie perspective, broad beans do require more effort to grow than easy growing veg like garlic or sorrel, or fruit like strawberries. 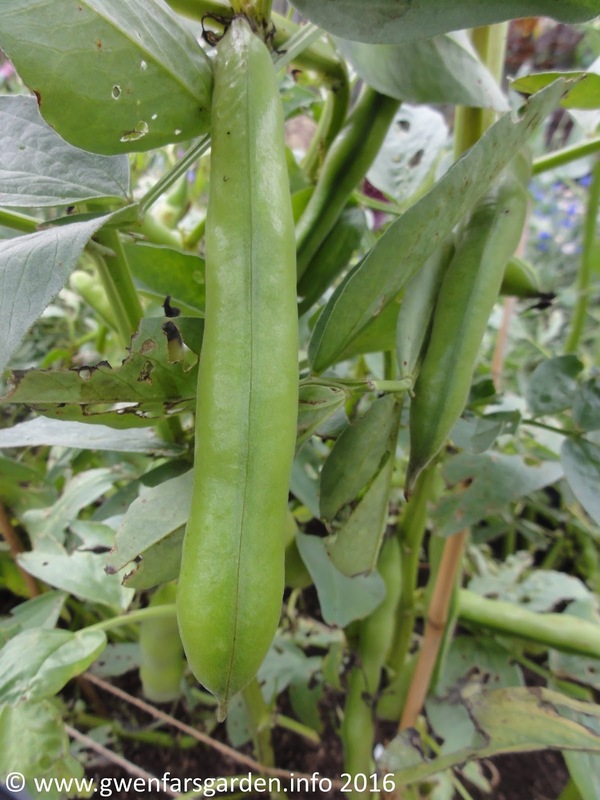 In my post introducing Spoonie Veg, I gave Broad Beans a rating of 3. 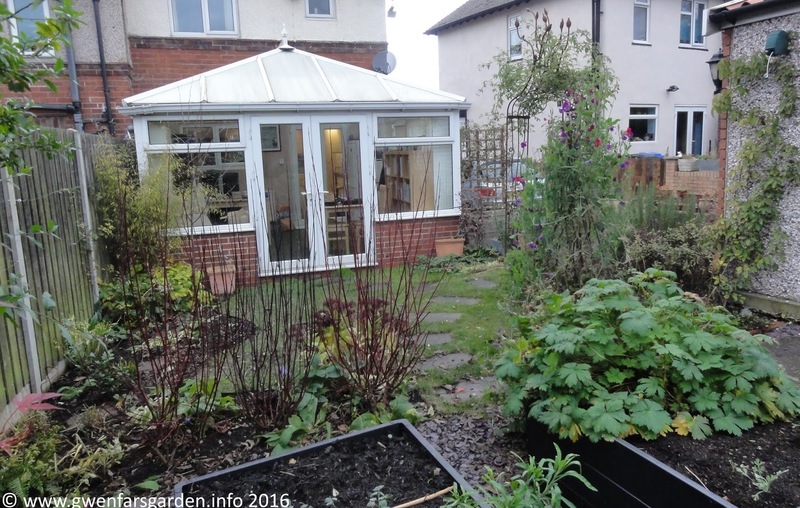 That being: 1-2 requires few spoons, 3-4 moderate spoons, and 5 hard, lots of spoons needed in order to grow that fruit, veg or herb. There are both tall and dwarf broad bean varieties available to grow. Some can be sown in Autumn and 'over-winter', and others should only be sown in Spring. Your seeds packets will tell you what type of broad bean you have and when to sow. I like to sow mine in Autumn, for as with garlic, I like knowing that I have food growing, even if slowly, over winter. Some people suggest Autumn-sown broad beans have a better chance to beat blackfly (more on this below), but in my experience the blackfly don't know this, and affect Autumn and Spring-sown beans the same. 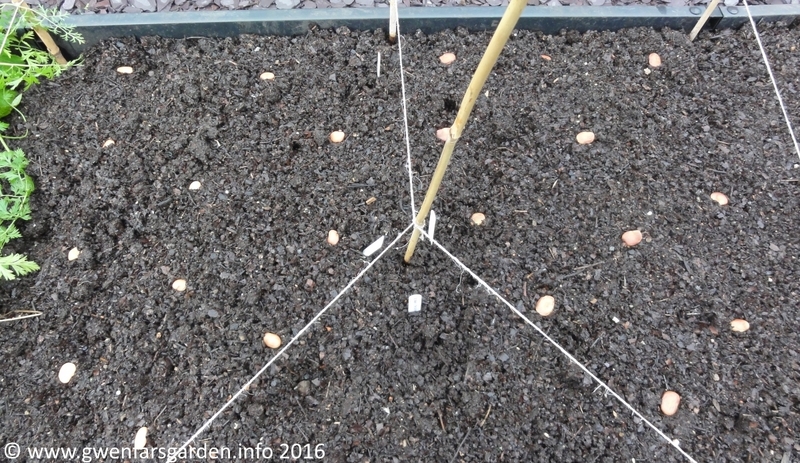 Spacing out broad beans, the string dividing different varieties. 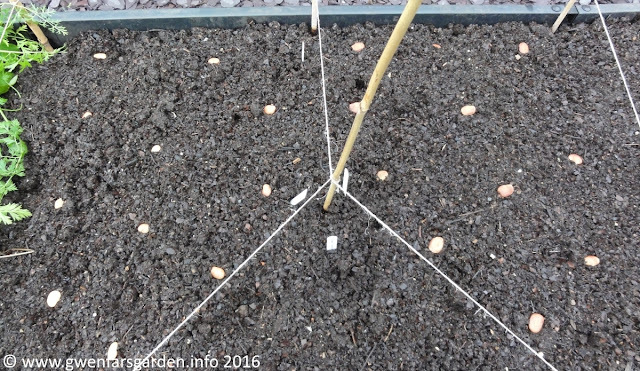 Some time ago I wrote a post on sowing broad beans via micro-tasking and I recommend you read this for detail on preparing the soil and sowing your broad beans. This breaks down all the different tasks and will be helpful in particular, for those with a chronic illness, and those new to growing may also find this useful. 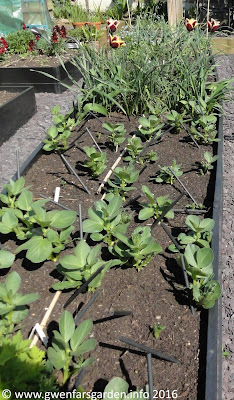 Depending on the weather, you may have your first shoots from autumn-sown broad beans come up in November (if you sowed in October). But if the cold hits, then it might not be until early Spring. Once your beans get to several good sized true leaves (see right), make sure you pinch out the tips (which you could add to a salad). This encourages the beans to develop at least two, if not more stalks, which means more beans. Note, though, that you should only pinch out tips for tall varieties, such as Aquadulce Claudia, Masterpiece Green Longpod and Bunyards Exhibition. I've tried it on the dwarf variety The Sutton in the last couple of years, and found that I got more stalks, but hardly any beans on any of them. If you are growing tall varieties you may need to stake them, particularly if you have a problem with high winds. Try to remember to stake them before they get too tall. Trust me, I've learnt the hard way! It's SO much more work trying to stake fully grown plants. In high winds. In the rain. From a spoonie perspective, growing dwarf varieties means no staking, so less work. Other than this, the key other tasks until harvest time is keep the plants weed free (so all the nutrients go to the beans developing, and not on the weeds) and to water them, particularly when they start flowering, and during any dry periods. 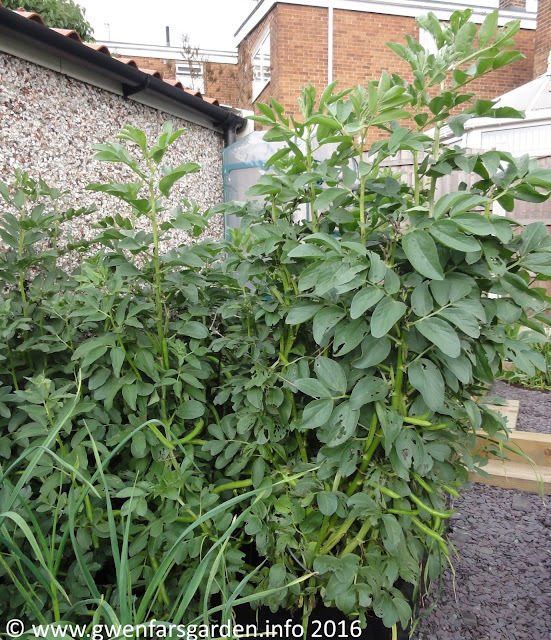 You can grow broad beans in containers, but my experience has shown that the tall varieties don't seem to do that well. So go for a dwarf variety like The Sutton. As usual with container grown plants, you have to water them more frequently as their roots cannot dig down into the soil. So check your containers regularly and water when needed. 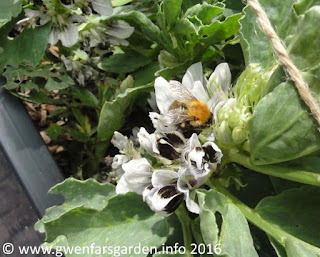 It might be useful to give container grown plants a liquid feed, like comfrey, mid-Spring, to ensure the plants have enough nutrients. One big pest is mice, who love to eat your newly planted seeds so that they don't even get started. 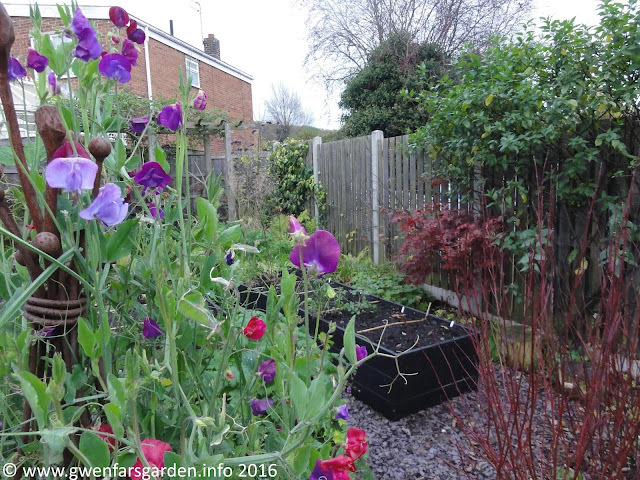 Whilst mice are not currently a problem in my Sheffield garden, I found I had a problem with mice back at my allotment in Oxford, and the only answer was to sow seeds in modules and plant them out once the seedlings had developed a few good sized true leaves. Don't know what true leaves are? The first leaves a seed sends up are 'seed leaves'. The next leaves that follow on from this are the true leaves. The seed leaves die back once the true leaves get going. Then there are slugs that like to have a good chomp on newly sprouted beans. A good chomp down to the base so there is nothing left. Again, the answer to this is sowing in modules and planting out the young plants. 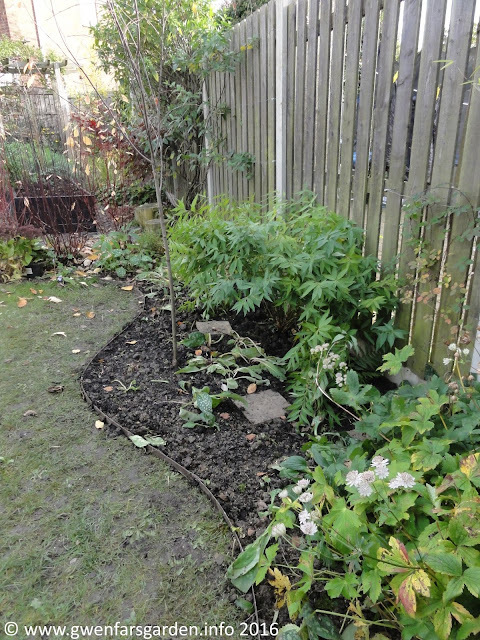 Slugs tend to not bother once the plants are a few centimetres tall. It's the newly germinated leaves they love. If you get past the mice and slugs, then the next, and biggest pest, is blackfly (aphids). As mentioned above, my experience with blackfly, at both my Oxford allotment and in my Sheffield garden, is that they don't know the 'rule' about autumn-sown broad beans being less affected. They laugh in the face of that so-called rule. I've not found any tip yet that can deter blackfly from the outset. But I do have one tip that works once you notice you have infected plants. It seems to be generally well-known that squirting soapy water onto affected plants can help. But none of the information that I've come across on this goes into any detail, other than say 'squirt with soapy water'. So here it is. When you come across the infected plants, use a plastic squirt bottle with your soapy water, and shoot the bastards. Give them a tsunami of soapy water. But, and this is important, if you only do this once, they'll soon be back. What you have to do is give them a good squirt every morning and evening religiously, generally for about three to four days. Yes, this requires the energy to be able to squirt, but luckily it is a very low form of energy use, and I think the satisfaction of shooting at them twice a day for three days outweighs the energy expended. And, importantly, it works. Every time. Usually I don't get anymore blackfly for the season once I've destroyed the first lot that turn up. By the way, some people use their hoses on the blackfly. I've tried this in the past but I've found the blackfly always come back. Others swear by ladybirds who feed on all aphids, which is certainly true if you get enough ladybirds in your garden. Sadly I don't, so soapy water it is. The soap basically suffocates the blackfly, but not any ladybirds you do have, they will be ok. Finally, disease. A disease that can often affect young seedlings is damping off. This is when they are attacked by some fungi-like spores that lead the young plant to collapse and die. Damping off is caused by high humidity, poor air circulation, growing seedlings too close together, and often because of over-watering. There is some useful information about damping off on the RHS website. As this section shows, the pest and diseases affecting broad beans will mean more work. So it's really important to consider this when you think about growing broad beans. In all honesty, if you are unable to keep on top of these, especially the blackfly, you will have used up quite a number of spoons for what could end up being a small crop. If all has gone well, harvest time generally starts in June and may go for up to six weeks, depending on how many plants you have grown. Try to harvest when the beans are smaller, as they taste better. I find in approximately 1m square I can grow enough for two people to harvest for 10-12 meals over about a month. You can extend harvests, if you have spoons and space, by sowing a second batch of seeds in May to harvest in August-September. Ideally you want to harvest the beans as close to when you are going to cook them. However, 'just picked' is for people who are well and don't need to have a rest after picking the beans. For spoonies, once you harvest your beans, put them in the fridge to keep them fresh. De-pod them later, then back into the fridge again. And then in the evening use them in your recipes. They may not be the trendy 'just picked' beans, but they will still taste amazing. If you pick broad beans when they are really young, then you can eat the whole bean, no podding necessary. Something I must try next year. The best bit! There are countless recipes for broad beans. One of my favourites is Broad Bean, Mint and Feta Salad. 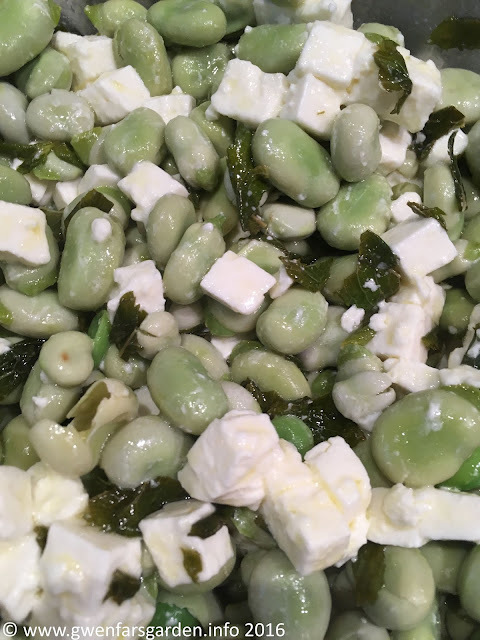 The taste of the just steamed broad beans with the cool tangy feta is divine. Then there is Broad Bean, Bacon and Mint Penne. And I've adapted Emma Coopers Cheesy Peasy Pasta Bake, swapping the peas with broad beans, which work just as well. 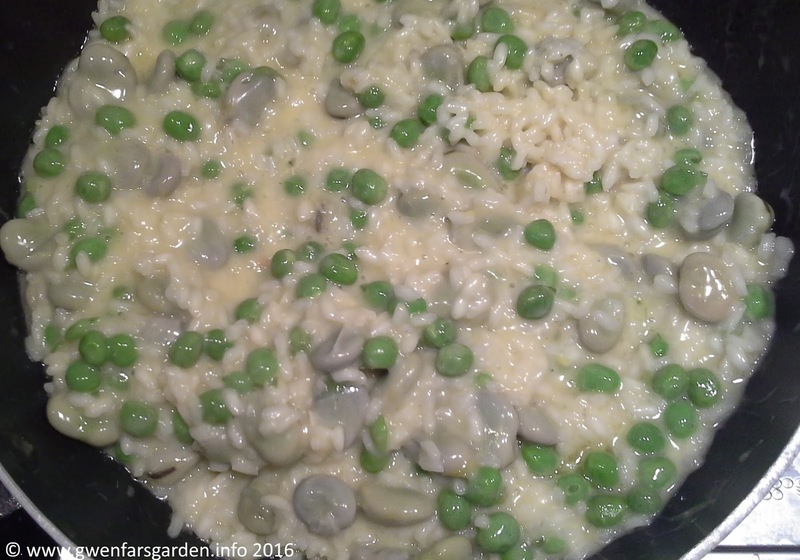 Another recipe, one I use towards the end of the harvest cycle when my first peas are ready, is Broad Bean and Pea Risotto. And don't forget you can always go for the classic, steamed with a dob of butter. Mmmmm, broad beans. As shown, broad beans are more work to grow compared to garlic or sorrel, and the spoonie Veg rating of three reflects this. 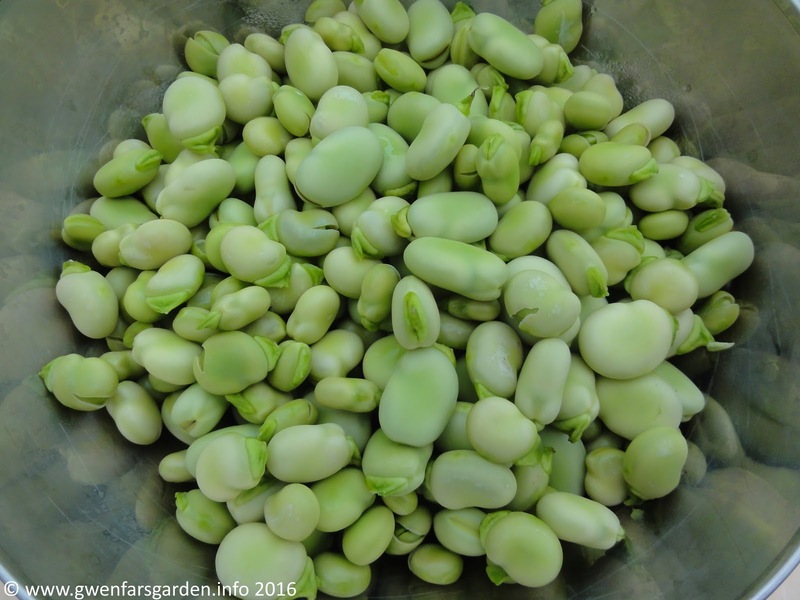 If you have a chronic illness or mobility limitations, then you would need to decide if the amount and period of cropping (approximately six weeks) is worth the work/spoons needed to grow broad beans. For me, my love of eating broad beans makes it worth using the extra spoons needed to grow them. 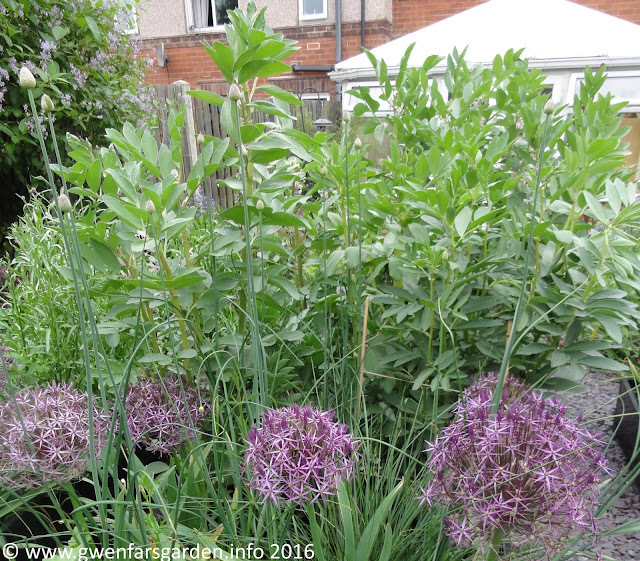 In fact, in 2017, I'm limiting my veg growing to pretty much to the essentials, just garlic and broad beans. That's how much broad beans mean to me. How do you find growing broad beans? If you are healthy person, would you say they are easier to grow than a three rating, or would you say that this rating reflects the effort needed to grow regardless of health? And if you have a ill-health, have you tried growing broad beans and how did you find it? Would you rate broad beans at a higher spoonie rating than three? Please let us know your experiences in the comments below. I'd love to hear your thoughts and comments on your experience, so don't be shy! When I've been photographing my garden in recent months, I've shied off capturing the conservatory end of the Shady Border, because I was quite unhappy with it. I realised the border needed more height and a better shape than the straight lines it had. It felt flat, and the Ligularia and self-seeded Astrantia seedlings were taking over the space. 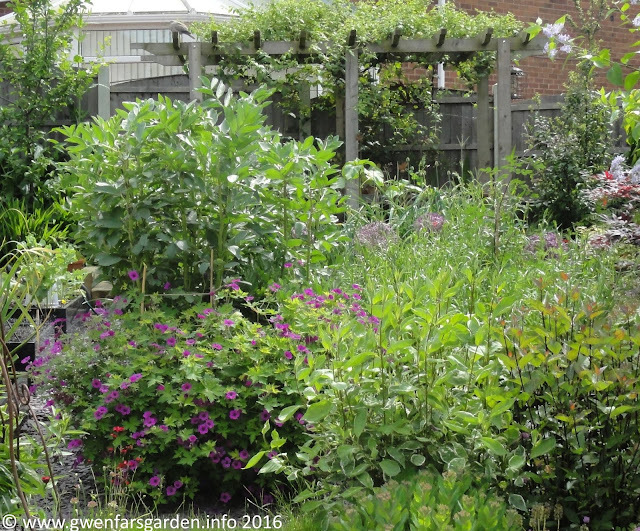 I had been unable to do anything about it as I had limited energy to spend in the garden as it was, and most of what I did have focused on the veg growing. 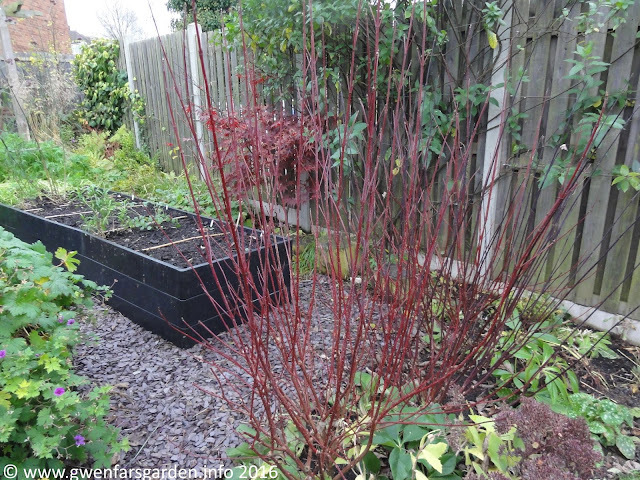 I did manage to work on a simple redesign and I even bought a tree, Amelanchier laevis 'R.J. Hilton' to help add the height. Last week, after finally being able to find a gardener, the skillful Andrea, to help me, the work was done. The border as been widened a bit, and the straight lines have gone. Although it looks a bit bare as I await the replanted plants to get growing again, I still think it looks better than how it looked before. The Amlanchier is almost bare now, so you don't immediately see the height, but it will be more obvious next Spring. By getting rid of some of the crowding Astrantias, I'm hoping the Akebia quinata will feel more like growing next Spring. 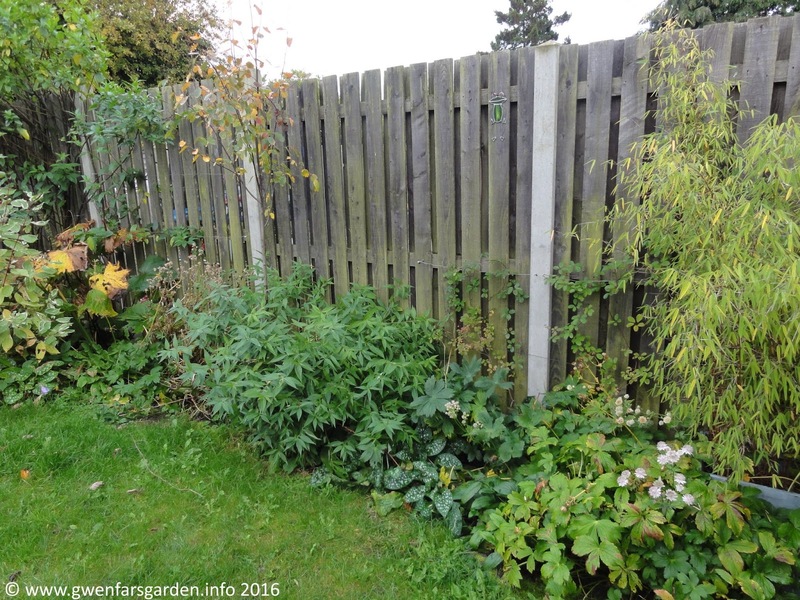 This is an evergreen, and one of the jobs for next time Andrea is here, is to put up more wire to train it along the fence more. I think the Amlanchier and the Akebia, along with the Potato tree, Solanum crispum 'Glasnevin' on the left side, should help fill up the fence more and add the height and structure the border needed. Pulmonaria 'New Ensign' was quite a clump, so Andrea split it up and planted it throughout the border. The same with Omphalodes cappadocica 'Cherry Ingram', and several primulas including Primula 'Guinevere'. Taller primulas were moved to the middle of the border. Also planted was some bulbs of the autumn crocus, Crocus Speciosus Cassiope, which should come up in the next few weeks (they were trying to grow in the bag!). Plus I have a bunch of other bulbs to plant for Spring and early Summer flowering, such as Snowdrop Woronowii, Fritillaria Meleagris, Allium Oreophilum and Narcissus Pappy George. Finally, a couple of stepping stones were added. This is to make it easier to access the back of the border, and so I can access the hook from which my retractable clothes line attaches too. 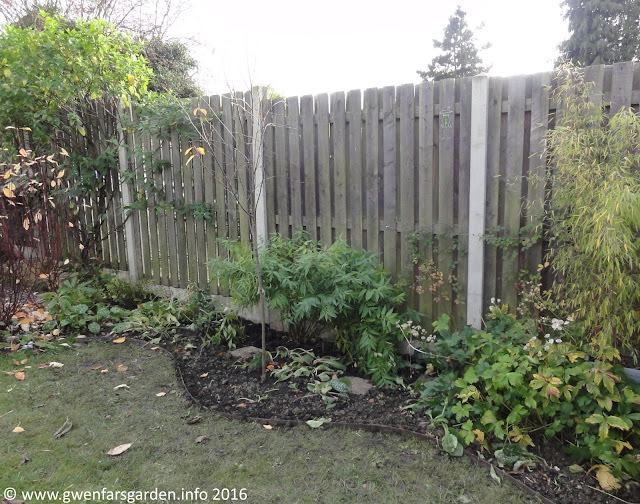 These will 'disappear' into the border once the new growth starts next Spring. 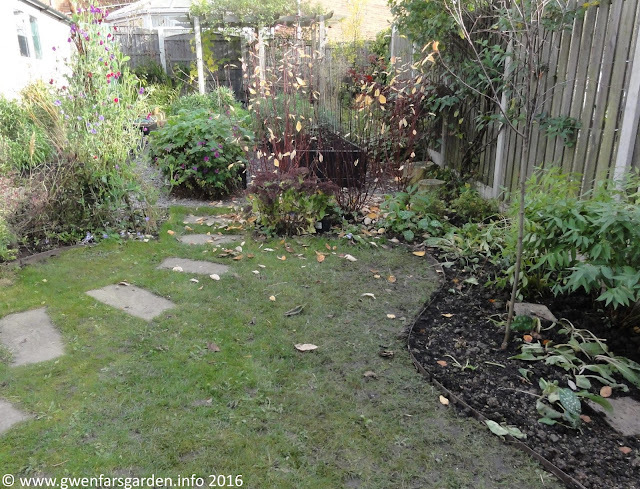 On the whole, I think the new curves in this area of the garden gives it a much better look and feel. I'm very happy with it, and with my new gardener, Andrea*, who has been a real find. *Heartfelt thanks to Joanna Dobson, who saw my plea on Twitter and recommended Andrea.